Size of Male: 60-65 lbs., 24-26 in. Size of Female: 60-65 lbs., 22-24 in. The Belgian Malinois dog is the shorthaired variety of the breeds collectively referred to as the Belgian Shepherd (the Tervuren, the Groenendael, the Malinois and the Laekenois). A top police dog, the Malinois enjoys the distinction of being the planet’s favorite peace keeper. There’s a city in Belgium called Malines where the dogs derived their name. As with many other working dogs, the Belgian Malinois kept a low profile. They were unknown even in the late 19th century when dog shows became a trend. By the turn of the 20th century, the efforts of a professor finally paid off. He was able to study the dogs of Belgium and classify them into breeds, among which the Malinois was a recognized favorite. Today, you can see more Belgian Shepherd Malinois dogs at the police department than at home. They are reportedly more in demand than their close look-alikes, the German Shepherds! Are you ready to raise a Malinois? Not everyone is. These protective and athletic dogs require adequate socialization and dominant ownership to adjust well to domestic life. They have unusually high prey drives and will resort to destructive behavior when bored or lonely. 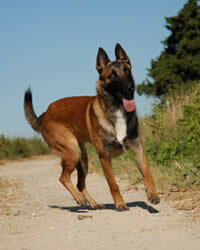 The well tempered Malinois is pleasant, obedient and reliable with kids. Living Environment – Many Malinois dogs can tolerate apartment dwelling, but the optimal environment for them is a home that has a mid-sized to huge yard. Their space requirement is very much tied to their exercise needs and ultra-active lifestyle. As a precautionary measure, keep tiny animals out of sight and beyond the dog’s reach. Grooming – Luckily in the grooming department, you can expect minimal effort. Weekly brushing is all that’s needed. Be warned though that the breed sheds hair a lot. A vacuum cleaner will come in handy. Diet & Exercise – As opposed to beef, which comes highly recommended for the Belgian Tervuren, a low-fiber, protein-rich diet from chicken or fish is best for the Belgian Shepherd Malinois. The breed can easily gain weight from high-calorie meals and may develop skin allergies. Vigilant dietary monitoring is strongly advised. The dogs demand lots of jogging and playing to vent their energy. Make it a point to combine physical challenges with mental stimulation. One without the other could bore the spirited dog. The usual leashed walks won’t suffice. Health – The Malinois is the sturdiest of all Belgian Shepherd varieties. Although there aren’t any definite major concerns, there have been cases of epilepsy and elbow and hip dysplasia seen in the breed. The dogs are also sensitive to anesthesia. For seasoned dog owners with a dominant personality to match, the Belgian Malinois is one of the most malleable pooches to train. Much of this is owed to the fact that the breed enjoys being given tasks and sports a remarkably high intelligence quotient. Caveat: The breed can get sneaky around newbies.